The Austin Healey 3000 is an iconic 60's British sports car that won it's class in many European rallies. Trackdays are now able to offer you a chance to get behind the wheel of this simple yet beautifully crafted car for four laps around Heyford Park in Bicester, Oxfordshire. 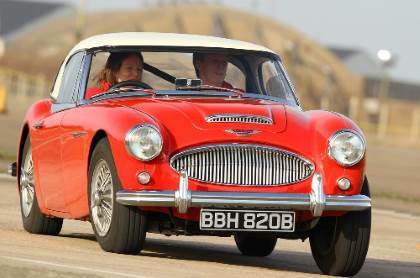 This Experience would make a perfect gift for anyone into their classic cars. Get behind the wheel of the Aston Martin DB9 and feel just like James Bond while driving this stunning British Supercar at Bruntingthorpe Proving ground. A special offer double driving experience - Drive two Supercars under expert instruction for 3 laps of Heyford Park Circuit in Oxfordshire with Trackdays.co.uk. Take a spin round in two famous supercars for a driving experience at the Teesside Autodrome. Book as an open gift voucher or book directly onto a date.